The winter season 2018/2019 is over. We thank all our guests for their trust and look forward to welcoming you again next winter. From November 2019 we will be there for you again. 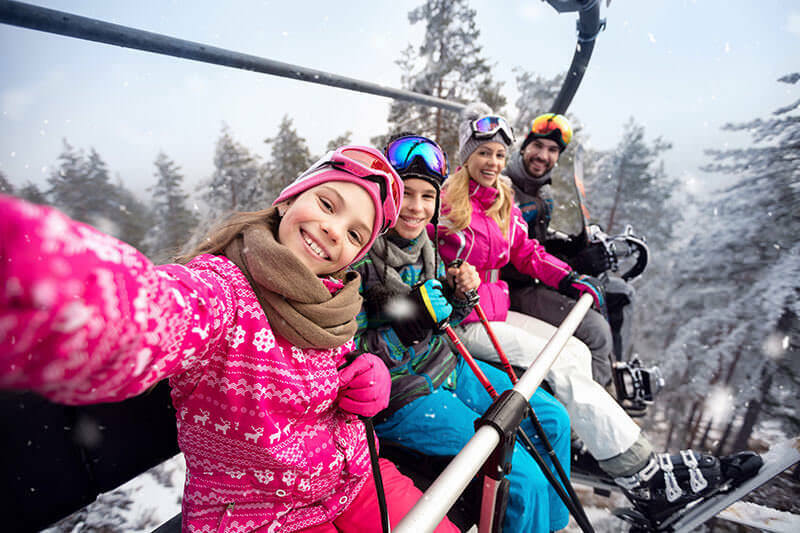 If you would like to learn skiing or snowboarding individually or you will improve your style, we provide you with an experienced ski instructor in order to reach your personal goal. This instructor will meet your requirements and proficiency specifically and flexibly. 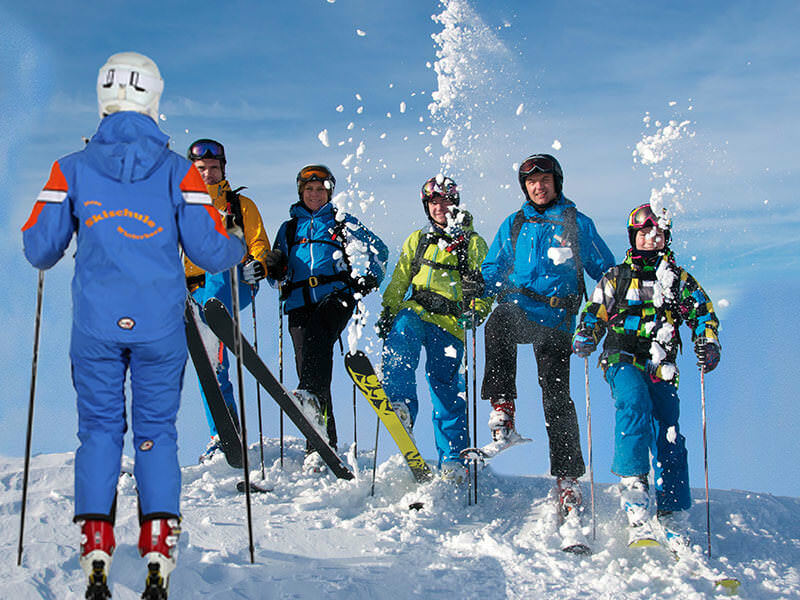 In our ski school we offer private lessons and group courses. Learn skiing and/or snowboarding efficiently in a group and have fun together! Share your learning progresses and combine them with the professional support of our qualified ski and snowboarding instructors. Our ski and snowboard instructors react to every individual proficiency level and optimize therefore consequently the success within the group. We take care of you from the beginning on easy pistes up to the advanced level on challenging trails. Snowboard: 10:00 – 12:00 a.m. Lunch break: 11:30 – 12:30 p.m.
Further group courses on demand in our ski school office. 1.What time does it take to learn skiing? Due to our long lasting experience we recommend you to book three courses. Normally, you need this time to dominate the technique safely and to enjoy skiing with a lot of fun afterwards. 2.I don’t have any skiing or snowboarding equipment. Should I buy or rent one? In general, we advise you not to buy the equipment. If you recognize that you are not interested in skiing or snowboarding you will invest a lot of money for free. Our ski and snowboard instructors will recommend you the suitable ski or board after your lesson. Important! Please rent your equipment before the lesson! Skis, shoes and sticks. We recommend you a helmet. In our kinder ski school it is obligatory to wear a helmet. A snowboard, shoes, a helmet and gloves with protectors are recommended. If you only have gloves for skiing, we ask you to utilize protectors which are also used for inline-skating. 3.Where do I get the skiing and/or snowboarding equipment? On the way from the parking to our ski school, you will find several certified ski rentals. The qualified staff will arrange the suitable equipment for you. 4.Is it possible to book group- or private lessons online? Yes, you can book online on our website. After the receipt of your payment you will be sure to take part in a group course or to have a private lesson. 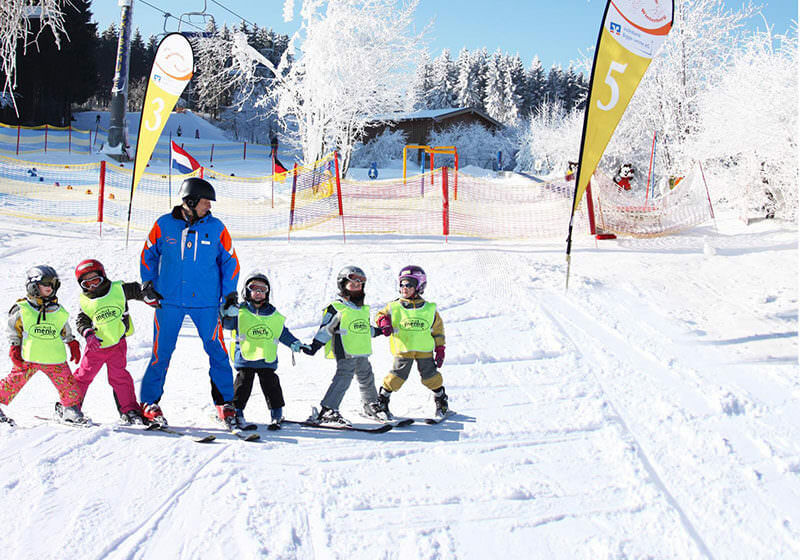 5.Why can children only take part in the kinder ski school from 5 years on? Children under 5 have a lot more ambitions to play than children who are older. They are not able or willing to follow the course constantly. If they are bored or if it is too exhausting for them, they will lose interest quickly. That would be a pitty! 6.Do you offer all-day children facilities? Yes, we do. For an additional price of 15 Euro we also take care of your children during noon. 7.When do I have to be at the reception? Please be at the reception until 9:30 a.m. with all your equipment. 8.I booked online. Do I have to queue? No, there is an online check-in next to the front desk, especially for all online-booking clients. Please take the order confirmation with you, which you got by mail. You scan the bar code on the document at the front desk and then you will get the information where you have to wait for the beginning of the lesson (which group course you have to join or which instructor you will have if you booked a private lesson). Our skiing or snowboarding instructors are also pleased to help you. 9.Where do I find the reception? You find the reception 50 m above the valley station “Lift Nr. 12”, directly on the ski pist. The skiing and snowboarding lesson will start at 10:00 a.m.
10.Can I pay with an EC card? 11.I don’t know if I have to book a lesson for beginners or for advanced learners. Beginner, when you haven’t skied before. Advanced learner, when you can stop and do turns and when you are able to go down on an easy (blue) pist. 12.Is it better to book a group course or a private lesson? We recommend you to book a group course when you are a beginner. After the group course the instructor will tell you if it makes sense to book a group course for advanced learners or a private lesson. It is better to book a private lesson when you have a special problem or you would like to improve your style individually. 13.Do you offer lessons for handicapped people? Yes, we do. 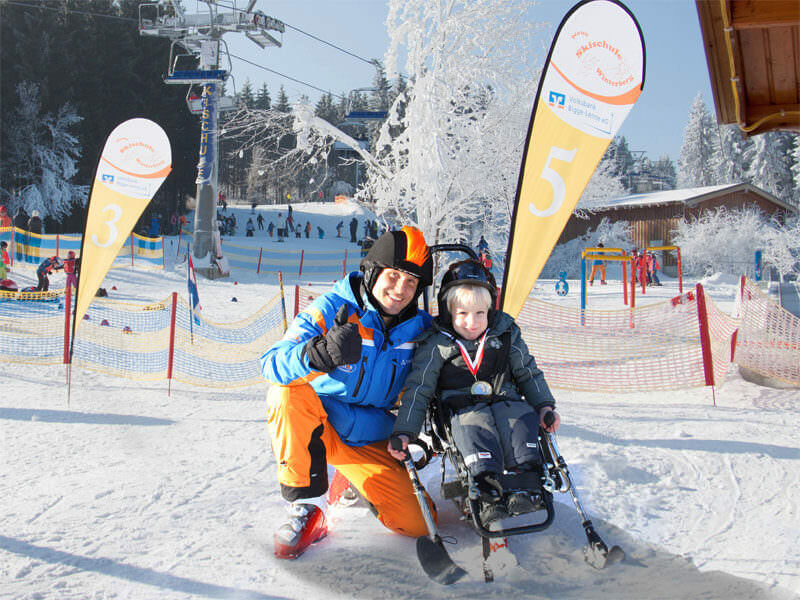 Our skiing instructor Karl-Heinz has a special education to teach handicapped people. He has a long lasting experience as skiing instructor in the national paralympic committee during the winter and he is able to react on your handicap. Please write an email or phone us! If you have any further questions, we will glad to help you. 14.Do I need a ticket for the lift before the lesson start? You don’t need a ticket for the lift if you booked a group course for beginners. During the course and dependent on the progress of the participants, the instructor will decide if or when you need a ticket. Do you have questions or suggestions? Do you need any further information? Please call us directly or use the message folder on this side. We would be very happy if you contact us! Confirm privacy notice By entering and sending your data, you consent to our receiving, storing and evaluating your details for the purpose of answering your enquiry and any queries you may have. You can object to this at any time (right of withdrawal). See also our Privacy notice.